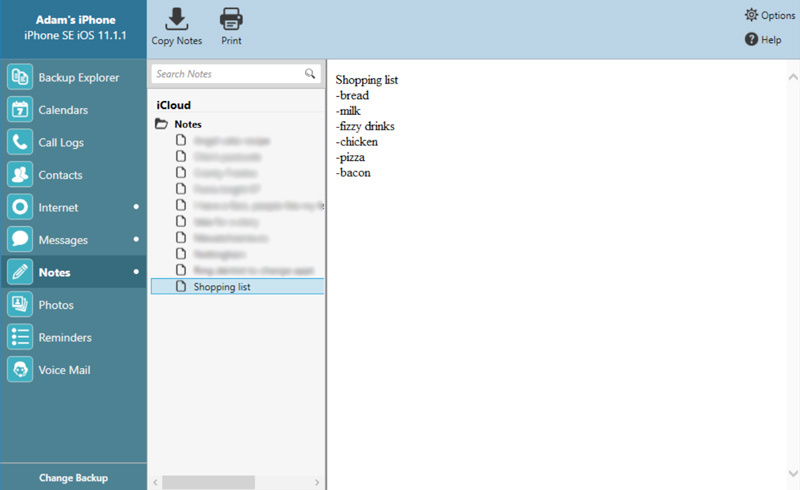 The iPhone Notes app is great for making quick notes to yourself, be it shopping lists, lecture notes, or reminders. These notes get backed up as part of your iTunes backup when you sync your iPhone with iTunes, so you can recover important notes if anything happens to the device or the notes get accidentally deleted. Unfortunately, iTunes does not allow you to directly access your notes in it's backup files. For this reason, to retrieve your notes, you can either perform a full restore from the backup to your iOS device, or use software like iBackup Extractor to extract the notes from the backup and save them to your computer. Select an iPhone backup from the list which you would like to access. Select the notes you would like to save, and click "Copy Notes"
To view the notes available on your backed up device, click "Notes" in the iBackup Extractor categories list; this will display the Note viewer. You can select which note to read by scrolling through the available notes being displayed. Once selected, it will be shown on the right side of the application's window. Here you will be able to see when it was last modified, and the contents of the note itself. Should you wish to save notes to your computer, select which notes to save on the listing and click the "Copy Notes" button on iBackup Extractor. It will ask you where to save the notes (default is desktop) and whether to save as HTML, PDF or text. To print out notes from iTunes backup of your iPhone, iPod Touch or iPad, simply select the notes that you wish to print, and click "Print" from the iBackup Extractor toolbar. You'll then be presented with your default print options for PC or Mac. When you're happy with the setting, click Print! Any notes retrieved from your iTunes backup by iBackup Extractor can be imported to your new iPod Touch, iPhone or iPad by following the steps provided by Apple.